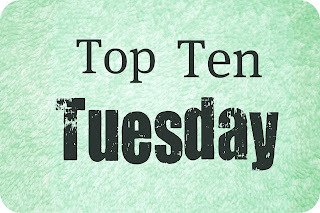 Work and planning for the big move to DC have taken a toll on my blog and instead of catching up on reviewing all of the books I’ve recently read, I’m doing a Top Ten Tuesday! Top Ten Tuesday is an original feature/weekly meme created at The Broke and the Bookish. I’m crazy excited for this book which is told from the perspective of a girl who can neither speak nor move but who’s mind is actually brilliant. Her story sounds haunting and it’s from such a unique perspective that I can’t help but be eager to start reading it. P.S. it also helps that critics and book lovers alike are raving about this novel. The infamous Bloggess always cracks me up when I read her blog so there is no way I can pass up a book that promises to be just as funny. The description of the book reads: In the nonfiction tradition of John Berendt ("Midnight in the Garden of Good and Evil") and Erik Larson ("The Devil in the White City") . . . Um can you say hooked?? Mentioning not one, but two of my favorite books ever is a sure fire way to get me to want to read this book. And as if that wasn’t enough my Best Friend in the whole world recommended it to me and then sent me the book. Score! Will be reading this very soon! Another book in my library book fair haul, this book seems like it’ll be the perfect sit by the pool, easy cheesy read. I am a huge history buff and I’m especially intrigued with the American Civil War which is why it’s nuts that I haven’t read this book yet. Worry not, I’m tackling this bad boy this summer. Having just finished The Count of Monte Cristo I’m all about revenge this summer. Here’s a snippet of the book’s description: “Seventy-seven-year-old Marylou Ahearn is going to kill Dr. Wilson Spriggs come hell or high water. In 1953, he gave her a radioactive cocktail without her consent as part of a secret government study that had horrible consequences. “ Sounds awesome! Confession time: I put off finishing a series because once I finish it that’s it. Well, it’s been a year or so since I started this series and I feel like it’s time to finish it. I fell in love with George R.R. Martin’s Game of Thrones series so I’m hoping these books can transport me as well. I recently read Jane Eyre and adored it so when a friend mentioned there was a book which captures the story of the Rochester’s crazy wife I knew it had to be added to my TBR list. This is a great list! I hope you're able to get through them this summer! I love Perks of Being a Wallflower and Gone with the Wind is a book I want to read as well but for very differnt reasons.